Mercan Dede and Secret Tribe's splendid 2002 release Nar realizes this elegant marriage of old and new stunningly. Along with the groups' spellbinding performances, it is helping them build a worldwide following. When the group plays in Turkey, they can draw as many as 20,000 people. But for Dede'whose name comes from a minor character in a contemporary Turkish novel'it has been a long, highly unconventional road to success. Raised poor in a Turkish village in the 1970s, Dede recalls the moment when listening to the radio as a six-year-old, he fell in love with the sound of the ney. But even when he moved to Istanbul to study journalism, he could not afford an instrument, so he made his first one from a length of plastic plumbing pipe. Although he eventually found a ney teacher, Dede did not pursue music as a career. He was more deeply involved with photography, and by chance, an official at the Saskatoon Public Library in Canada saw some of his work and invited him to come and do an exhibition. Dede wound up studying multimedia in Saskatoon, and he worked in a bar to earn rent money. That was where he first encountered the art of deejaying. One day the bar's deejay couldn't make it, and Dede stepped in. The techno revolution was just beginning, and Dede was getting in on the ground floor. By the mid-80s, he was traveling to do 'technotribalhouse' deejay gigs under the name Arkin Allen. He debuted as Mercan Dede in 1995 with he released his first album, Sufi Dreams, recorded for Golden Horn Records in San Francisco. 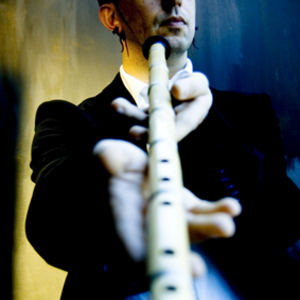 The album was a minimalist techno ambiant project featuring the ney flute, and it earned impressive reviews. A few years later, Dede moved to Montreal where he first studied, then taught, at Concordia University, moving ever more forcefully into the burgeoning techno scene. Recordings he made under the name Mercan Dede got noticed in Istanbul, and a festival invited him to perform, expecting an older gentleman, as Dede means 'grandfather' in Turkish. When people saw a young band mixing techno and tradition, they were exhilarated, and Dede has stuck with this adapted name ever since. Dede formed his first group in 1997 and created more recordings, Journeys of a Dervish (Golden Horn, 1999) Seyahatname (Doublemoon, 2001), and Nar (Doublemoon, 2002 ) From the start, the group was more an idea than a set lineup. 'I always get different musicians,' says Dede, 'all the time. When I do a European tour, each country, I choose a guest musician from that country. This is the essence of the group.' The Canadian TV station Bravo filmed and aired Dede's concert with Turkish master kemence (Persian violin) player Ihsan Ozgen at the Canadian Museum of Civilization in the Fall of 1998. German television producers Saarlandischer Rundfunk were so moved by Dede's music that they traveled to Canada to feature him in their documentary about Sufi Music. While filming Dede at work in Montreal and Toronto in February of 1998, the producers requested that Dede create the soundtrack for this project. Same year Mercan Dede's album Seyahatname includes pieces composed for a dance theatre project, directed and choreographed by Beyhan Murphy for the Turkish State Modern Dance Troupe. Both as Mercan Dede and his alter ego DJ Arkin Allen, he has performed at events as diverse as the Black & Blue 98 (a world-renowned Montreal circuit party attended by 15,000 people) and a concert of improvisations with on classical Turkish music at the Canadian Museum of Civilization. In July 2001, Mercan Dede performed at the highly acclaimed Montreal Jazz Festivals, sharing the General Motors Big Event stage with Burhan ?-?al and Jamaaladeen Tacuma, in a concert called 'East Meets the West' before an audience of more than 170,000 people. On that same evening, right after his concert, he appeared at Spectrum, this time performing with his project Montreal Tribal Trio, again as part of the festival program. In 2002, the group electrified the WOMEX world music trade fair in Essen, Germany, and also the International Transmusicales Festival in Rennes. Dede has also performed with such musical personalities as Kani Karaca, I'hsan ?-zgen, Misirli Ahmet, Ilhan Ersahin, Peter Murphy, Natacha Atlas, Azam Ali Musafir, I'lhan Ers?ahin, Jamaledeen Tacuma, Hugh Marsh, Omar Sosa, Mich Gerber, Fazil Say, Susheela Raman, Trans Global Underground, Dhafer Youssef, Coldcut, Dhol Foundation, Emma Shaplin, Ludavico Eunadi, Trilok Gurtu. Mercan Dede and Secret Tribe's summer tour 2003 included Montreux Jazz Festival (Switzerland), Arezzo Wave (I'taly), Skopje Festival (Macedonia), Moers Festival (Germany),World Roots Festival (The Netherlands), Jaen-Etnosur (Spain), Rhythm Sticks Festival (UK) and many others. The group's 2004 U.S. debut took place at Joe's Pub in New York in January, 2004, as part of the city's groundbreaking world music marathon at Global Fest. Mercan Dede was invited to play at GlobalFest' (APAP Conference) in New York in January 2004, where 16 different bands from 5 continents played. He performed and completed his USA tour with 3 young gypsy musicians from turkey in their early teens. Mercan Dede's concert was reviewed by various press and music critics including Global Rhythm Magazine who made a cover story on him and his music calling his performance at Joes Pub; " one of the best world music performance of recent years" . The following year, turkey & germany based Production Company "Medya' made a documentary film about his life and music which aired the same year and received great reviews. Mercan Dede also provided music for Pina Bausch's recent work, "Istanbul, Nefes' performed in the city it was named for in the spring of 2003. He calls meeting Pina Bausch one of the most amazing moment in his career. He is commissioned by the Turkish Ministry of Culture as the music director of the G?ldestan Project. The project is destined to represent Turkish Culture and Arts all around the Globe. Over the next three years ( 2005,2006,2007) he travelled the world spanning over 1,5 million km and performed almost every corner of the world. He also released "Water" (2005) and Breath (2006) albums which both topped the BBC world music charts making him the first turkish artist whose albums received the #1 of the world music charts. Over the last 4 years he was also nominated in different categories of world music as the best world music artist of the year by BBC. In 2007, as a dedication to Sufi master Rumi, he recorded and released his last album "800" as a celebration of his masters 800th birthday. Following it's release, he chose to follow a different path in his life leaving both his beloved record label Doublemoon and management Pozitif, allowing him to continue his journey on his own. Recently he is living quietly and preparing new projects in Montreal. Although he declined to show his recent paintings and visual art works, feeling he is not yet ready, he is however giving signals to including visual arts in his future projects. Under 9 different names, he has released more than 100 singles world wide. Mercan Dede, Arkin Allen, Blueman and Poundmaker aside, he still keeps 5 other names secret even from his own management and family; believing that nothing should stand between sound and the ear, include the artist himself. Mercan Dede is keen on bring his extraordinary music and stagecraft to the entire world feeling that its inclusive spirit carries a profound message of understanding and reconciliation. 'I don't like the separation,' says Dede. 'The Sufi poet Rumi has a very good saying: 'If you are everywhere, you are nowhere. If you are somewhere, you are everywhere.' My somewhere is my heart. I try to figure it out. The rest'the hype, the trends'they are not important. We are here for nothing else but Love, the rest is nothing but bunch of gossip" If music does not make us a better person even in a small way, who cares if you are the best musician in the world. I prefer to be someone who follows his heart no matter where it goes. Succes is not something to which I aspire but rather I accept as simply a wonderful gift of life from the Creator as a recogniton of my naive and simple belief that with music we can help ourselves and others in a most humble way. Whether as Mercan Dede with his Secret Tribe or dj Arkin Allen with his tribal trio; he is one of the most unique artist uniting many people from different backgrounds regardless of their age, cultural background or personal differences never failing to impress his audiences with the explosive energy he creates on stage. He is rightly recognized as one of the most creative, unique yet modest artists in the world music scene today.